Olympic triathlete Will Clarke shared insights and inspiration at the official prize giving ceremony for the Pop-up Triathlon yesterday. Team Credit Suisse were the winners of the competition that took place for its first time running at Canary Wharf, earlier in the summer. With many still riding the glorious Team GB Olympic 2016 triathlon wave, The Castle Triathlon Series was delighted to continue triathlon related successes with the official presentation. Will Clarke was in Bejing 2008 as part of the Team GB Triathlon team coming an admirable 14th. Earlier this season 100 city workers, 28 teams, sweated it out as they competed against banking rivals in Montgomery Square, Canary Wharf in a staged event, organised by Castle Triathlon Series in partnership with Speedo and KPMG. Credit Suisse took the winning slot on the competitive leaderboard covering an impressive distance of 4,640 metres (172 metre lead) as their team swam for three minutes in an endless pool, biked for four minutes on a cycle ergometer and ran for three minutes on a treadmill. See the full scoreboard here. There was an impressive selection of teams including KPMG, Barclays, Santander, HSBC, Credit Suisse, Citi Bank, Morgan Stanley, Bank of America, NSPCC, Canary Wharf, Clifford Chance and many more. The teams were made up of three individuals, competing in one discipline each and representing the same company. This Wednesday (24 August) Credit Suisse received a winning trophy, £1,000 charity gift, courtesy of Speedo, which they will donate to national children’s charity NSPCC, and each team member got a KitBrix bag. The Castle Triathlon Series offer the opportunity for companies to have their own bespoke wave at their six-triathlon festivals hosted at iconic castles and stunning grounds. They also offer a hospitality tent with delectable food and drink for company members for both pre- and post-race refreshment. Key companies who have embraced the series since its formation are Morgan Stanley, Reckitt Benkiser and KPMG, who sent employees to the Series in 2015. Read more. 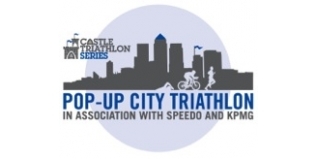 Register interest in the next Pop-up City Triathlon by emailing support@castletriathlonseries.co.uk or join the Castle Triathlon Series for their last UK event this season at Hever Castle in Kent (24/25 September 2016). Enter now.